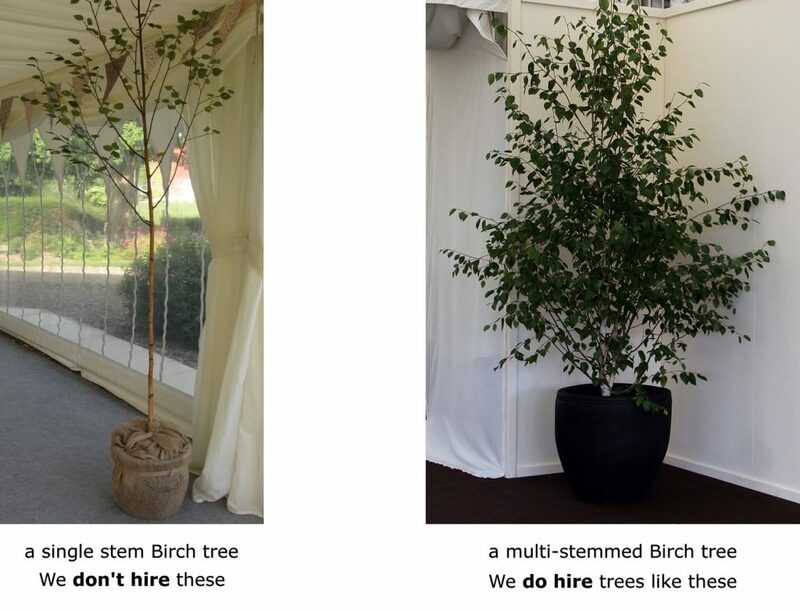 The Birch tree hire range is a very attractive addition to our range of hire trees. An incredibly cost effective hire option for any event that needs to incorporate trees into a theme. We stock jacquemontii Birch (Betula jacquemontii) these trees have white bark for added impact throughout the year. As a hire tree Birch can be used for a number of different purposes from English themes i.e. parks and woodlands through to creating walkways or to create a fresh and natural look at exhibitions and events. FAQ: We get asked why we discontinued hiring single stemmed Birch trees in favour of multi-stemmed trees. The answer is very simple – multi-stemmed trees look much much nicer, have more leaves and even the smallest trees in the hire range create more of an impact…as a client what would you rather have? After all it is you we are catering for. The image below shows exactly what the difference is. Which tree would you hire, the one on the left or the tree on the right? Self collection is only available on the smallest hire range of Birch trees – due to the difficulties of transporting trees. Birch Trees Placement: A wide range of uses for indoors or outdoor spaces – woodland themes, parks, or as standalone trees, as part of a display. Hire Period: All year round. If foliage is required April to October. N.B. The Birch is a deciduous tree. Birch Trees & Planter Hire Charge Per Unit: From £32.50 + per tree. A very cost effective tree which helps to create a stunning display. Background information. Primary renown in the UK for its bark colouration which covers and multitude of colours from silver, red, brown to nearly black. Apart from its natural function the Birch has traditionally had a vast range of uses in medicinal, food, drink, furniture, through to some more interesting activities. The Birch tree has become established throughout the temperate parts of the Northern hemisphere, mainly Europe, Northern America and Asia. Countries like Russian & Finland have made the Birch their national trees. We also have a wonderful selection of smaller multi-stemmed Birch trees introduced specifically for weddings and smaller spaces, which really come in to their own when you need to hire smaller trees.